"Dependable Performance for High Traffic Commercial Applications"
- Select Function: Passage, Privacy, Entrance, Classroom, Storeroom, or Single Dummy. - Lever Option: Saturn (SAT). - LD Models: Sold Less Cylinder. For matching Cylinders see "Companion Items" below. - PD Models: Sold with Schlage "C" Keyway, Keyed Different (KD); see additional "Keying Options" below. - Delivery: All Satin Chrome (626) Schlage AL-series Levers are In Stock. Please allow 3-5 days' lead time on all Brass (605) and Oil Rubbed Bronze (613) finishes. - Large diameter of mounting plate and rose covers new ANSI hollow metal door cutout. The Schlage Commercial AL-Series Levers are reversible. Function: The Schlage AL-Series Levers are available in Passage (AL10S), Privacy (AL40S), Entry/Office (AL50D), Keyed Entry (AL53D), Classroom (AL70D), Storeroom (AL80D), and Single Dummy (AL170D) function. Finish: The Schlage AL-Series Levers come in Brass (605), Oil Rubbed Bronze (613), and Satin Chrome (626) finish. Lever Design: The Schlage AL-Series Levers come in Saturn (SAT) design. 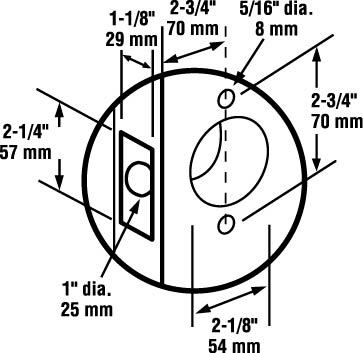 Cylinder Options: All Entry/Office (AL50LD), Entrance (AL53LD), Classroom (AL70LD), and Storeroom (AL80LD) functions are sold Less Cylinder; see "Companion Items" above for all Cylinder & Keying options. All Schlage AL-Series Locks come standard with Square Corner 2-3/4" Backset Latch (Spring Latch 11-116; Deadlatch 11-096) and Square Corner Strike (10-025). If you require 2-3/8" Backset (Spring Latch 11-068; Deadlatch 11-085) please order from our Latches Section. Latch: 1-1/8" x 2-1/4", Square Corner Faceplate, 1" housing diameter, 1/2" throw. Strike: 1-1/4" x 4-7/8", ANSI, Square Corner, No Box (10-025). Backset: Standard 2-3/4" Backset (Spring Latch 11-116; Deadlatch 11-096). Special Order Information: For pricing on any function or finish of the Schlage Commerical AL-Series Levers not found on this page please contact Taylor Security direct via e-mail (sales@taylorsecurity.com) or call us toll-free at 1-800-676-7670. - Keyed Entry (Entrance & Office): Unlocked by key from outside when outer lever is locked by push-button in inside lever. - Classroom (Classroom Lock): Inside lever is always active. Key releases outside lever. - Storeroom (Storeroom Lock): Outside lever fixed. Entrance by key only. Inside lever always unlocked. - Master Keyed: Locks are Keyed Different (KD) with 2 keys per lock; 1 Master Key opens all locks. Special Order Information: For pricing on any function or finish of the Schlage Commercial AL-Series Levers not found on this page please contact Taylor Security direct via e-mail (sales@taylorsecurity.com) or call us toll-free at 1-800-676-7670.